–Yesterday: High church worship, celebration, “Hallelujah!” Today: A walk through the woods with my dog, silent prayer, and a return to a disturbingly quiet, empty house. –Yesterday: I cook too much food, and I eat too much. Today: I acknowledge that God is not glorified in my lack of good stewardship or my overindulgence, and it’s not good for my body or soul either. –Yesterday: Hearing a sermon accented at key moments by booming thunder, running to the car during a downpour, my wife and I laughing and yelling, “Remember your baptism! Remember your baptism!” Today: Reflecting on what it means to live my baptism, thoughts shifting impatiently between the need for rest and recharge for my body and soul (the soaking rain) and living into a journey that responds to the thunderous biblical call to pursue justice. –Yesterday: Offering the bread of life, the cup of salvation in a church sanctuary. Today: Flashing back to an afternoon on a street in south Dallas, handing out soup and sandwiches, recalling the first moment when there was the spark of making the communal connection, a voice inside me softly whispering with each encounter, “The bread of life, the cup of salvation.” How will I serve the Lord’s Supper today? How will I experience communion? –Yesterday: Meeting the awkward looks, averted eyes of people whom I have never seen before at church. Wondering if any will come back. Thinking about a silly church sign. Today: Realizing that behind those eyes are a lot of stories I don’t know. Most certainly, there are people who have been hurt by the institutional church. 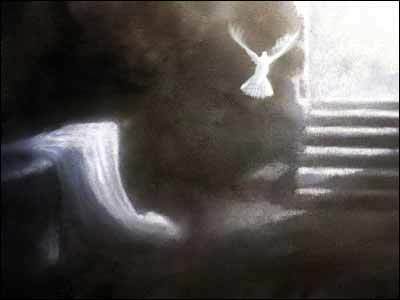 Maybe there are people who have given up on God, but decided to come anyway, at least this once at Easter, to see if they could find God again. How can I be open to their needs and available to them? How can I play a role in creating a faith community that hears them, sees them, and cares for them, in Jesus’ name? –Yesterday: No time to read the paper, I have to get ready for church. Today: I cannot avoid a front-page story about 1 million Texas children being without health insurance, and a report on the suffering and death along the Mexican border. I worry about our tendency to praise God on Sunday and do so little about injustice on Monday through Saturday (Amos 5:21-24). Will those of us who put on our finest clothes and shout praises to God in our beautiful churches on Sunday face judgment for what we do to God’s children the rest of the week? How can I help the church rediscover itself as a refuge, a sanctuary and a fiery advocate for the most vulnerable? How can I get out of my own comfort zone so I can get more into the will of God? How can I live in the light of the Resurrection, putting an end to the ways I unwittingly contribute to forces of death and destruction in the world? Yesterday: Encountering someone suffering a recent loss and remembering that some people find it very difficult to shout “Hallelujah!” on Easter morning, because it is a time that will always be associated with the passing of a loved one. Today: Praying that God give me the ability not to get so wrapped up in myself that I fail to see and embrace those around me who need to be seen and embraced. Yesterday: Sin and death conquered. Today: Now what?